Investors remain headstrong as Apple's recent Q2 2016 revenue dip was not as bad as analysts were predicting. The fluctuating stock market reflects not only facts and hard numbers, but also expectations and "gut feelings" from stockholders as well. 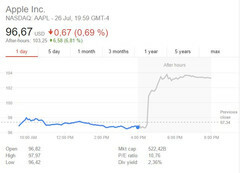 Apple recently made public its latest quarterly figures and despite the drop in sales, both media and shareholders still reacted very positively to the news. Tech Crunch is reporting that Apple had exceeded shareholder expectations as of Q2 2016 as analysts had predicted a revenue of 42.09 billion USD compared to the 42.4 billion USD that the Cupertino company actually made. Nonetheless, this still represents a revenue dip of about 15 percent YoY. Outspoken investor and CNBC television host Jim Cramer commented on the unusual phenomenon of a bullish market following Apple's 15 percent YoY decline. According to Cramer, investor expectations of Apple have been steadily dropping and this is the first dramatic Q2 fall after 13 years of steady success. In other words, Apple was "good enough" this past quarter. Apple CEO Tim Cook recently met with Chinese officials regarding regional bans on iPhone devices and the blocking of iTunes and iBooks. The company has been falling in rank against Chinese smartphone manufacturers like Xiaomi and Huawei and is currently being outsold by the Galaxy S7 series in North America.